Everest, Ama Dablam, Lhotse, Changtse, Nuptse, and scores of other crests as seen from a peaked stance. Guided city tours in Pashupatinath, Buddhanath, Bhaktapur, Changunarayan etc. The Luxury Everest Base Camp with Helicopter flight from Base Camp to Lukla is the adventure of a lifetime, a journey for those whose dreams fly higher than even the clouds. Miles from cars, conveniences, and daily luxuries, you'll saturate your spirit in natural beauty and stretch your personal endurance beyond what you thought possible. The path begins in ancient Kathmandu, where you'll acclimate and explore the city visiting UNESCO World Heirtage Sites at your leisure while anticipating your ascent. Then, we take a scenic flight to Lukla from Kathmandu airport. After we are equipped with the right gear and crews, we trek to Phakding and slowly enter into Sagarmatha National Park. We experience diverse species of alpine flora and fauna. Namche Bazar is one of the prime highlights of Everest Base Camp Trek. Passing via Tengboche and Lobuche, we, finally, arrive at Everest Base Camp. 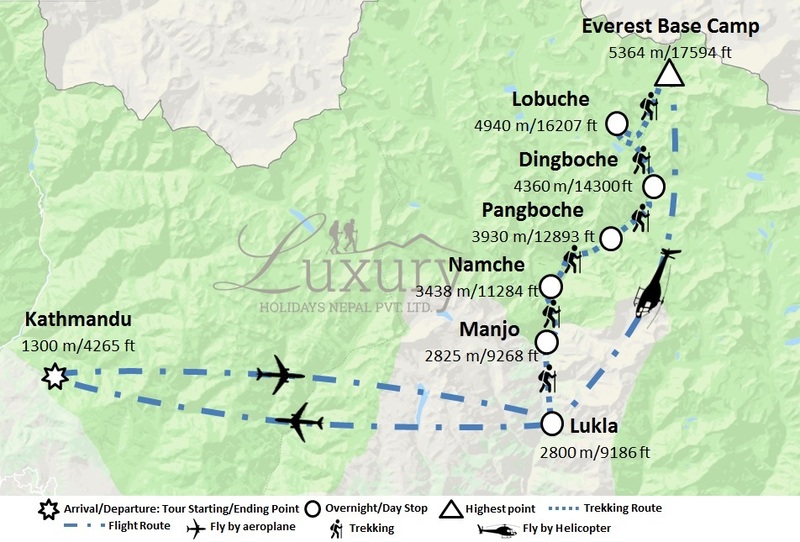 On returning , we take a helicopter flight from Everest Base Camp to Lukla airport to escape the same trail. Your trek to Everest Base Camp at 5,364m (over 3.5 miles!) to the base of the world's tallest mountain will bring you over suspension bridges spanning chasms of thin air, through hidden Buddhist monasteries, and into the heart of the warm, rugged Sherpa culture. As you travel alongside thrill seekers and photographers from all over the globe, you'll spy Cho Oyu, Lhotse, and Makalu - three of Earth's 10 tallest peaks! You'll rest easy at night in cozy, traditional teahouses knowing that you experienced, knowledgeable guides and porters are there to ensure the safest, most enjoyable, most fascinating experience possible. You'll support local economies, discover hidden strengths in yourself, and make both friends and memories that will last a lifetime. After arriving in Kathmandu, a representative from Luxury Holidays Nepal will pick up from the airport and take to your hotel. In the afternoon, you may take a rest or visit Luxury Holidays Nepal’s office. At evening, we host a pre-trip meeting at your hotel in Kathmandu and introduce your tour and trekking guide. Please seek this opportunity to ask questions about your trip. This includes a final briefing and preparations for the trip. For the meeting, please make sure you bring your passport, three copies of passport-size photos, and a readable copy of your travel insurance policy. During this meeting, please clear the due balance, if any. Please inform us in advance if you will be arriving late and therefore are unable to attend the pre-trip meeting. An early morning start takes you to Tribhuwan International Airport in Kathmandu for the 30-minute scenic flight to Tenzing and Hillary Airport at Lukla at 2,804 m/9,199 ft. On arrival at the airport guide will brief you and introduce your porters before your trek begins towards Manjo. After landing, you will explore the village while Sherpa crew sort and load our trekking equipment. Then, trek begins by descending towards the Dudh Kosi River where you join the main trail to Namche Bazaar, located just above Chaunrikharka (2,713 m/8,900 ft). The walking is easy. After passing through the small village of Ghat, it is a short walk to Phakding and then to Manjo. After breakfast, your trek starts. You will continue trek along the banks of the Dudh Kosi, crossing the majestic river many times on exciting suspension bridges laden with prayer flags. After entering Sagamartha National Park, the trail climbs steeply with breathtaking views. Namche Bazaar known as the Gateway to Everest, which is home to many quality restaurants, hotels, lodges, shops, money exchange, internet cafe and a bakery. Namche is one of the biggest villages along the whole Everest trail. 05 Days Acclimatization Day at Namche Bazaar. There are plenty of things to do around Namche Bazaar, and you can spend a day here acclimatizing. Namche Bazaar is the main center of the Khumbu region and has government offices, ATMs, Internet cafes, shops, restaurants, and a colorful market. Your guides can take to explore the real charm of Namche Bazaar. Hiking to Sagarmatha National Park rewards trekkers with a sunrise view and the views of Mount Everest, Lhotse, Nuptse, Ama Dablam, Thamserku, Kongde and so on. If you are interested in a day hike, you trek to Khumjung village (12401 ft)-a beautiful village with a Sherpa settlement. In exploring Namche Bazar, you observe traditional Sherpa life, Khumjung Hillary School and enjoy the flora and fauna found at such altitude. After breakfast your trek starts. The trek continues along the rushing glacial waters of the Dudh Kosi with magnificent views of the mountains. The trek will end at an altitude of 3,930m / 12,893ft. On reaching Tengboche you will see the local monastery. Inside, the monastery are incredibly ornate wall hangings, a 20-foot sculpture of Buddha, and the musical instruments and robes of the Lamas. From Tengboche the trail drops to Debuche, crosses another exciting suspension bridge on the Imja Khola, and climbs to Pangboche village. The trek continues, leading to the quaint traditional Sherpa village of Dingboche with its exquisite views of Lhotse, Island Peak, and Ama Dablam. Take rests sometime so you avoid getting affected by the altitude. Dingboche is a popular stop for trekkers and climbers headed to Mt. Everest, Ama Dablam or Imja Tse. The village is beautiful with an array of fields enclosed by stone walls to protect barley, buckwheat and potatoes from the cold wind and grazing animals. You spend a day at Dingboche for acclimatization. You take day hikes to either Nagarjun Hill or Chukkhung Valley for great views of Makalu, Lhotse, Chalotse, Tawache and Ama Dablam. The trail continues along the lateral moraine of the Khumbu Glacier and passes by stone memorials for climbers who have perished on nearby summits. Continue to climb as we are heading to the altitude of 4,910m / 16,018ft at Lobuche, which is really just a few huts at the foot of the giant Lobuche peak. Some breathing problems may arise today due to the altitude. Note: None of the lodges in this village has attached-bathroom facility. We will keep you at the best available lodge. You will take the trail to Everest Base Camp. Continuing straight ahead, across the Indian army mountaineers' memorials. The path from here can be misleading; hence, it is important that to follow your lead Sherpa diligently. The walk is strenuous due to the thin air in the high altitude. You will pass through rocky dunes, moraine and streams before reaching the Everest Base Camp. Upon reaching the Everest Base Camp, you will see the tents of mountaineers that stand out in bright colors against the monotony of gray surroundings (especially in the spring). Nuptse, Khumbuste and Pumori are the mountains you can view from the base camp. You will get back to Lukla by Helicopter. Catch an early morning flight to Kathmandu after your long mountain journey. After reaching Kathmandu, you can take a rest or do some souvenir shopping. If you want to explore any other areas of Kathmandu, you may do that today. Your guides can help you with both souvenir shopping. There will be a dinner and half hour massage in the evening to celebrate the successful completion of your journey. Overnight at 5 star hotel. Accommodation in 5-star category hotel in Kathmandu (The Dwarika’s Hotel or Hyatt Regency) in twin sharing bed and breakfast basis. Highest available standard Lodges and Guesthouses accommodation during the trek. (We provide accommodation at Yeti Mountain Home, Everest Summit Lodge and Hotel Namche with attached toilet bathroom facilities. In two villages Lobuche and Gorakshep, none of the lodges have attached toilets and bathrooms. In these locations we will keep you at the best available lodges.) in twin/double sharing bed basis. Everest National Park permits, TIMS permit for trekking and Monument entrance fee. Helicopter Flight from Everest base camp to Lukla. Luxury Holidays Nepal’s duffel bag, Sleeping bag, Down jacket, T-shirt and trekking map-If necessary. Half hour massage and dinner for last night in 5 star Hotel. The time we had in Nepal was truly an unforgettable journey. Travelling to Nepal was a life-changing experience. The trek we’ve completed in Nepal, from Lukla to Everest base camp, was amazing—crossing suspension bridges which was quite scary for us hahaha, eating organic meals that were made to order, meeting the beautiful peoples of Nepal, time spend without electronics, really reminded us how out of touch we've gotten with the world. This journey helped to spend time with ourselves and with basic life, mindfully: eating, sleeping, trekking because we usually don’t have time due to our busy life. We have to advise, it is a good idea to train yourself before you step on a trek, especially, if you don’t hike and using a helicopter while returning is a very good idea. We recommend trekking pole, a warm sleeping bag & headlamp, as the guesthouse room did not have heating or lighting available at night during your trekking. A good pair of hiking shoes is a must and staying hydrated is very important, due to high altitude. The outhouses on the way, were actually, more pleasant than the western toilets. What really made the trek incredible was our trek leader (Bishal Bhandari from Luxury Holidays Nepal)—he was very knowledgeable and caring with very good English. The important thing that everyone needs to know while travelling to Everest is that there may be flight delays, due to poor flying visibility, which may leave you stranded for a few more days longer in Nepal than planned so when you get your visa for Nepal make sure you have minimum 2 days extra. Thank you Luxury Holidays Nepal for this beautiful trek with excellent service. Hope to see you soon. Namaste!! Luxury Holidays Nepal will provide you 5 star hotels in Kathmandu and highest available standard Lodges and Guesthouses accommodation during the trek. (We provide accommodation at Yeti Mountain Home, Everest Summit Lodge and Hotel Namche with attached toilet bathroom facilities. In two villages Lobuche and Gorakshep, none of the lodges have attached toilets and bathrooms. In these locations, we will keep you at the best available lodges.) in twin/double sharing bed basis. Your breakfast included in Kathmandu and all meals during trekking. Travelers take their breakfast and dinner at the tea house where they stay and lunch is taken during the trail in the local lodge. Luxury Holidays Nepal will offer you private vehicle for airport transferal and flight from Kathmandu-Lukla-Kathmandu. Helicopter flight from Everest Base Camp to Lukla. In case the flight delay/cancellation happens at the start of the trip and it goes so long that it disturbs your onward travel schedule, you are free to choose an alternative trip such as a trek in the Annapurna, Langtang, or any other region. If you are not interested in the alternative trip and would rather wait for your original preferred trip, you are welcome to wait in Kathmandu for as many days as it takes to get a flight to Lukla. However, please note that there will be no refund if you lose time waiting at the airport and do not take an alternative tour or you only do a short trek later due to time limitation. If the cancellation happens before the trip, we will provide you accommodation and lunch in a guesthouse in Kathmandu. In case of the flight delay/cancellation after finishing of the trek, you will be responsible for all your expenses. Please also note that you will not be entitled to any refund for the services (such as hotel, transportation, flight, etc.) included in the package that you would not use later.